Here you will find all the IWI events for June as well as local happenings in the Basel area over the Summer. The IWI’s organised events will be taking a break throughout July and August, so the next newsletter will be in September. What’s been happening in May? Kicking off May with the first Bake Off of the year. 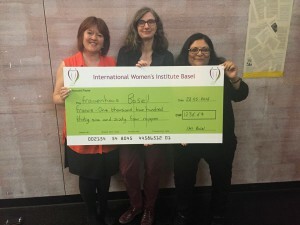 The Bake off was a huge success and managed to raise a whopping 1236.64 CHF for the Basel Frauenhaus, an essential service offering help and support to women and their children in crisis. 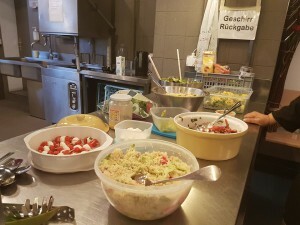 Other events in May included the return of International Kitchen, where we started off with a healthy salad pot luck. For anyone interested, participants shared their recipes on the event page on FB. 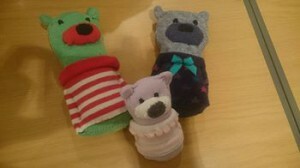 We also had a book swap, a gin tasting event at Barfly (hangovers included), coffee morning in Manor, a beautiful Sunny Wednesday walk in Bruderholz and of course the crafty cafe, where Helen demonstrated some sock animals. Friday 3rd :Theatre – I Love You, You’re Perfect, Now Change! 7 pm, Kronenweg 9, 4102 Binningen, Switzerland. 21:00 Live music to enjoy and have a boogie. Let’s celebrate friendship, fun and laughter! Please contact us on FB in order to join the party. 9 – 11 am, Please contact us on FB to join. 7 pm, Rampe Theatre, Byfangweg 6, Basel. Tickets 30 CHF, please buy your own in advance. European adventures in the search for the perfect sausage! little bit about its origins. patchwork technique: English paper piecing. CC stamp), or simply come along for a drink and a chat! 5 pm, Theatre Arleccino, Walkeweg 122, Basel. A relaxed evening of crafts! stamp), or simply come along for a drink and a chat! What Else Is On In Basel Over Summer? Museum Tinguely. From 8 years, bring a snack. Family treasure hunt full of scents and smells (duration 1 hour). • Monday 13th – Sunday 19th June: Art Parcours, Altstadt, Basel. Switzerland’s first and only art fair solely dedicated to photography. • Thursday 16th – Sunday 19th June: Art Basel, Messe, Basel. • Sundays in June: Kindermarkthalle, 1 pm. • Friday 1st July: Summerblues in Kleinbasel. • Saturday 2nd July: Zoo Night, Basel Zolli. Grün 80 Park, daily at 3 pm and 5 pm in the arena. • Tuesday 12th July: Stimmen Festival, Lörrach, Germany. • Thursday 14th – Saturday 16th: Summerstag open-air music festival. • Wednesday 20th – Saturday 30th July: Basel Tattoo, Kasernenplatz. • Tuesday 26th July – Sunday 14th August: Im Fluss Music am Rhein. • Thursday 28th July – Sunday 21st August: Allianz Cinema, Münsterp. • Sun 31st July – 1st August (2 am). Swiss National Day on the Rhein. • Friday 5th – Sunday 7th August. River Nights Openair. Rheinfelden. • Friday 12th – Saturday 13th August. Open Air Basel. • Tuesday 16th August: The Basel Rhein Swim. As you can see, there are many activities in the Basel area this summer to enjoy. We’d love to have you join us for events that will be posted on our Facebook IWI group and look forward to meeting you soon. Have a great summer!